Updated 13th June: Rufus Wainwright will now perform Don't Cry for Me Argentina. Made in Dagenham's Gemma Arterton is the latest name to join stars honouring Sir Tim Rice which now includes Tim Minchin, Tom Chaplin, Rob Brydon, Roger Daltrey, Alexander Armstrong, Sophie Ellis-Bextor, Cynthia Erivo, Seth Lakeman, Julian Ovenden, Rick Wakeman and Frances Ruffelle. Updated 24th May: Sir Tim Rice is to celebrate nearly 50 years as a lyricist with a A Life in Song on 8th July at the Royal Festival Hall.The concert will be filmed for broadcast later in the year. He will be in conversation with host Michael Grade with music being performed from some of his biggest successes including Joseph and the Technicolor Dreamcoat, Evita and The Lion King with music provided by the BBC Concert Orchestra conducted by Mike Dixon. 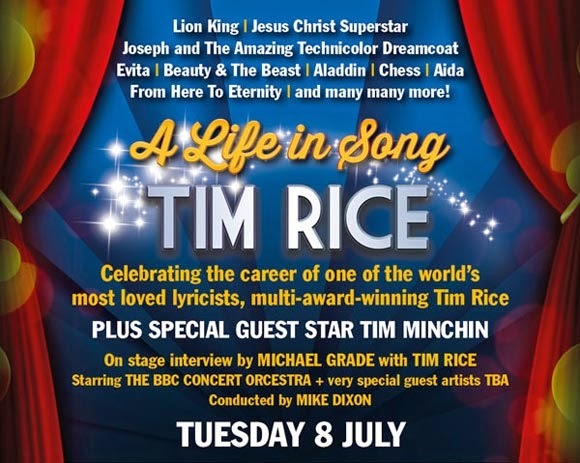 Tim Minchin was announced today as one of the special guests who will be performing at this tribute to Sir Tim Rice. As well as writing the award wining musical Matilda, he toured with the first ever arena tour of Jesus Christ Superstar playing Judas Iscariot. Also guesting will be musical theatre and Downton Abbey star Julian Ovenden, comedian, presenter and actor Rob Brydon and Tom Chaplin from the rock band Keane. Sir Tim, who turns 70 this year recently had a new musical From Here To Eternity running at the Shaftesbury Theatre. He has collaborated with Sir Andrew Lloyd Webber, Sir Elton John on The Lion King and Aida as well as working with Abba stars Benny Andersson and Bjorn Ulvaeus on Chess. He has won three Academy Awards for film scores from Evita, Aladdin and The Lion King.